Greetings once again from the People’s Republic of China. Apologies for the long stretch between dispatches, but we’ve hardly had a moment to spare over the course of the last six weeks. We’re back in Beijing now after spending just over a month in the city of Anyang, where Katrinka worked on her archaeological research project. It’s been an adventure, to say the least! Anyang is located in northern Henan, China’s most densely populated province, with ninety million people living in an area approximately the size of Oregon. 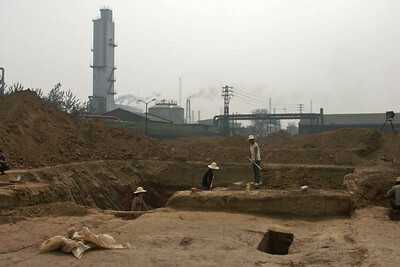 Henan is also one of China’s poorest provinces and eighty percent of its citizens live in rural villages and on farms. Anyang is one of Henan Province’s “small” cities, with a population of a meager 5.2 million. Probably a million or so live in the central city (which to my eyes appears to be not much larger geographically than Berkeley) and the rest live on the outskirts and periphery of town. At first glance, Anyang looks just like most other Chinese cities. There’s a central downtown area that is undergoing the archetypal refurbishment (scaffolding and cranes are everywhere) and sports a number of post-modern high-rises and brand-new shopping plazas. There’s a Ming-era (1300-1600 AD) city wall, bell tower and drum tower, typical of many cities in China, and there’s a Ming temple with a five-story pagoda (purportedly the first in China in which each successive level is wider than the one below it so that the pagoda tapers inward from top to bottom) in the very center of town. The outer sections of the city, wrapped around Anyang’s downtown, are characterized by 1950s through 1970s dorm-like 4- and 5- story residential boxes and broad dusty streets lined with cubby-hole stores selling everything from bicycles and fly-swatters to cigarettes and bottled-water. There are street vendors selling mostly fruit (especially watermelons), but also some of just about everything else you could imagine. Like Beijing, the streets are filled with people and vehicles of all sorts (are donkeys considered vehicles?) but it doesn’t feel in the least bit crowded, just … populated. Upon closer inspection, however, one begins to see fundamental distinctions between Anyang and Beijing. In the same sense that New York City or Los Angeles isn’t really a complete and true reflection of America, Beijing does not tell a visitor the whole story of China. In fact, many Chinese would argue that Beijing is really an anomaly, both in terms of having undergone such an enormous face-lift over the past decade and because of the fact that Beijing is now teetering on the edge of actually being a cosmopolitan and even fashionable city (at least cosmetically). Anyang, on the other hand, is the “real deal”, clearly far more reflective of current Chinese culture and society as Anyang is far more similar to the “average” Chinese city than is Beijing and the other Chinese megalopolises, Shanghai, Guangzhou, and Hong Kong. Katrinka & I had a sneak peek at Anyang when we visited for three days a couple of years ago, but a month’s stay this time has opened up the books. The first significant thing that one notices rather quickly is that Anyang is fundamentally dirty. Most cities in China are not clean; Beijing is somewhat of an exception (though it is not by any stretch of the imagination sanitary), but Anyang is downright filthy. The streets and sidewalks are coated with a fine layer of dust which turns to mud after it rains. Black soot clings to the white brick walls of Anyang’s buildings; even heavy rains don’t seem to be able to wash it away. The hotel that we stayed at in Anyang, The Ancai, is barely two years old, yet it is already showing signs of accumulated grime. There are dead bugs lying overturned in the hotel’s hallways and apparently one of the Ancai’s restaurants has a pet rat, because as the critter zipped about from table to table one morning at breakfast, the staff giggled and “shushed” us as we looked on in shock and disbelief. We were also treated to the experience of the Ancai’s resident bats dive-bombing us in front of the hotel in the evenings; evidently they mistook us for giant mosquitoes. The Ancai is a four-star hotel, by the way, if that gives you a sense of perspective on what lesser accommodations in Anyang might be like in terms of cleanliness. The air pollution in Anyang is epidemic; it’s rare that one can actually see the orb of the sun through the grey haze lingering over the city. 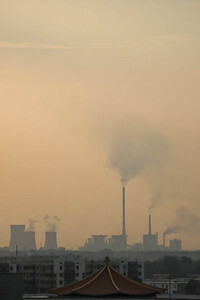 The particulate matter in the air is compliments primarily of the steel mill, coal-fueled power plants (which serve Anyang, as well as other parts of China), and hundreds of factories that lurk on the edge of town. 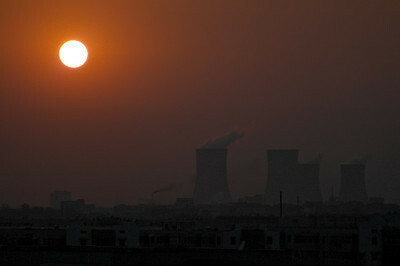 The dominant feature of Anyang’s skyline, besides the downtown high-rises and gothic radio masts, are the dozens of skyscraping smokestacks and monolithic cooling towers gathered like sentinels on the northern and western edges of the city. One evening, after a storm had quickly blown through town and cleared the air to some degree, we actually saw the sun appear through the dispersing clouds as it descended towards the western horizon. For a few fleeting moments, it seemed we’d witness a beautiful Anyang sunset. But then suddenly, as the sun dipped behind the billowing black, brown, and white smoke emanating from all the stacks, the sky abruptly darkened and took on a diffuse, eerie brownish-orange glow that looked almost apocalyptic. I’ll never forget it. It was at once stark and beautiful. Because one of the archaeological excavations that Katrinka worked at is adjacent to the entrance of the steel mill, we had several opportunities to observe up close the consequences of the pollution caused by the antiquated factory. The streets and villages surrounding the mill were literally covered in dark black soot and the air was thick with a strange smoky mist. Convoys of enormous diesel trucks carrying coal, as well as hundreds of smaller diesel tractors, paraded through the mill’s front gates, adding to the noxious mix. The whole scene looked like Dickensian London at the height of the Industrial Revolution. We could taste the pollution in our throats. In fact, one late afternoon as we were leaving the archaeological excavation, we saw a mill worker staggering out the gate grasping his throat and choking profusely. He doubled over and vomited as four of his co-workers rushed over to assist him. It was all quite surreal. The lack of cleanliness is China is largely a function of the country’s overarching pollution, but much of it is culturally endemic. It became clear to us quite quickly that the standards of cleanliness in China are far lower than one would hope for a country at this relatively advanced stage of its development. Public spitting, while now officially discouraged by the government, is still commonplace. I watched as a well-dressed businessman sitting in the Ancai hotel lobby noisily and quite ceremoniously clammed right on the carpet; no one else in the lobby so much as flinched, though the girl at the coffee bar seemed amused by the expression on my face. Food is eaten here only after careful consideration by the eater. The best food-preparation facilities at Anyang’s finer restaurants were of dubious standards; you can well imagine what the little hole-in-the-wall restaurants, food stalls and street vendors were like. Even the restaurants in our four-star hotel saw nothing wrong with re-using table settings. And food-service workers have apparently not been indoctrinated into the habit of washing their hands after using the bathroom (we have all-too-much empirical evidence of this) and even when they do, one still has to take into account the fact that most of China’s produce is grown on local countryside cooperatives where cleanliness standards are non-existent and the crops are fertilized with human feces, among God-knows-what-else. The realities of village life came into focus one afternoon when we visited an old archaeological site way out in the countryside. The site is located at a small brick-making facility in the middle of a vast cornfield near an old village. Upon arriving at the village, parking at the side of the dirt road next to the cornfield, and opening the doors to the Jeep, we were immediately overwhelmed by the unmistakable smell of raw sewage. As we quickly slammed the doors shut and proceeded a few meters further up the road to escape the oppressive stench, our driver explained that we had just inadvertently parked at the spot where the collected sewage from the village residents (there’s no plumbing) is deposited and stored for use as crop fertilizer. When we returned a few hours later, the jeep was covered from front to rear and top to bottom with flies. After hiking a half-mile or so through neck-high corn from the village road to the brick factory, we began our search for ancient pottery sherds in the outcroppings left behind after the fields were dug up to provide clay for the brick making process. I was quite pleased with myself after finding a number of sherds that I was able to distinguish as being of Shang dynasty origin (Katrinka’s area of study), as opposed to one of the many other dynastic sherd samples that abound in these fields, I looked down and saw what I recognized to be a bone sticking partially out of the ground. I unearthed it and ran excitedly over to Katrinka and our guide, Professor Tang Jigen, and asked them what kind of animal they thought the bone might belong to. Was it from a Shang dynasty sacrificial pit? Tang Jigen immediately disabused me of the notion that I found an animal bone as he informed me that what I held in my hand was a human femur. Wow! Did I hit the jackpot? Did I find evidence of a Shang tomb? No, Jigen explained, what I had found was the leg bone of a local villager who was probably buried rather recently. Not only do the countryside farmers fertilize their crops with their own excrement, they also bury their dead in the corn- and wheat-fields. In a nutshell, China’s produce is grown in a combination of cesspools and cemeteries. Can you say, “Hepatitis”? I hurriedly (but gently) replaced the bone in the ground EXACTLY where I found it, hoping that its former owner didn’t miss it while it was gone for a few minutes, and decided that I’d done quite enough archaeology for one day. While it was a bit unnerving to find the human bone, it should have come as little surprise because many of these Henan province villages and farms have been in use for over 4000 years. The particular village we were visiting is known to have been in constant use at least since Shang dynasty citizens lived there in 1700 B.C. That’s why we were there in the first place; each successive Chinese civilization was built on top of the previous one, leaving a multitude of well-preserved artifacts buried in the loess soil that is characteristic of China’s Northern Plain. The city of modern-day Anyang is literally built on top of Yinxu (pronounced “Yin-shoe”), the former capital city of the Shang dynasty that was buried for millennia under the loess soil. It was here, between approximately 1700 B.C. and 1050 B.C. that the Shang kings, queens, and elites held court over a populace of lesser elites, commoners, and peasantry before being ultimately conquered by the Zhou (pronounced Joe”) dynasty that followed. Katrinka is in fact hoping to flesh out the emergence of social stratification in this early civilization by determining through the process of residue analysis and other procedures what the various Shang social classes ate (including the distinct possibility that they ate each other). As there were Shang villages and burial grounds that radiated out from the central Yinxu site for miles into the modern-day countryside, anytime a new development of some kind is proposed in the Anyang area, a ‘salvage excavation’ is performed so that any archaeological artifacts can be removed before the construction begins (“Cultural Heritage” is again in vogue after many years of the government ignoring and rewriting China’s history, particularly during Mao’s Cultural Revolution). There were two such ‘salvage sites’ underway when we arrived in Anyang and it was a very lucky time for us to be there. One site, known as 220-KV for the old power plant next door, revealed several Shang house-foundations, a number of ash pits (basically communal garbage pits) containing fabulous pottery samples, and some tombs that held various human and animal sacrificial victims along with beautiful bronze vessels. The Shang buried their dead with various accoutrements for the afterlife; the higher one was in the social hierarchy, the more stuff they got buried with. One of the fellows whose tomb was unearthed at 220-KV must have been pretty important because he was entombed with no fewer than four sacrificial horses, an absolute rarity in the Shang dynasty. The other salvage site currently under excavation, known as Dasikongcun (pronounced “Da-see-kung-soon”) for the adjacent village of the same name, was even more impressive. Here, in addition to several tombs (including a rare un-looted specimen), and a network of terracotta pipes (use uncertain), three totally intact chariots were found, complete with a full compliment of sacrificial drivers and horses. (Some of the human sacrificial victims, incidentally, were thought to have been of “foreign” origin; captured warriors from rival states and kingdoms, etc. Others were apparently willing participants, fulfilling their duty to follow their lords and masters into the afterlife). It was astounding to watch as workers at Dasikongcun gingerly dug around a big square block of loess earth in a deep pit, barely exposing the hub of one of the chariot’s wheels. A week later, that big square block in the ground had metamorphosed into a fully unveiled chariot. More impressive, the excavators at both sites are local villagers who are so adept at their work that many of them can tell what manner of artifact lies beneath the earth simply by how the ground feels. This is a useful thing to know, as exemplified by the unusual incident of a buried horse skeleton being sliced in half right through it’s skull by excavators who didn’t realize it was there. Most of the local villagers are descended from ancestors who lived in the villages hundreds and even thousands of years ago; they all seem to know where to dig and what to dig for around Anyang. Neither the 220-KV excavation, nor the Dasikungcun dig, would even exist if it wasn’t for the fact that developments were planned at both sites: an upgraded power plant at 220-KV and a new textile facility to replace an old cotton factory at Dasikongcun. One of the perils, however, of salvage excavations such as these, is that there are often competing interests that are trying to rush along the process. 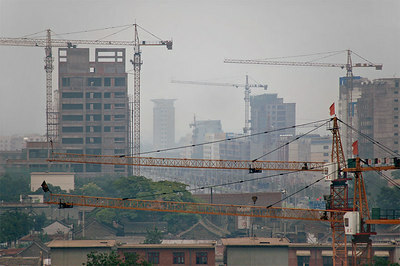 In the particular instance of Dasikongcun, a construction company was in a hurry to get started on their project. A grand total of only 53 Shang-era chariots have been unearthed over the course of a hundred years of Chinese archaeology and the three dug up at Dasikongcun were numbers 51 through 53. They were the first discovered in a long time. Number 53 was lost, however, when a construction crew waiting to build the new textile factory jumped the gun and snuck into the excavation late one night to do some preliminary work and accidentally crushed the chariot. Now that so many industries in China have been privatized, time is money and it’s commonplace to see construction crews working around the clock. If it had been a government construction crew, the accident never would have happened because government workers in China are like union workers in America: they don’t work one minute longer than they’re supposed to. Needless to say, there were a lot of enraged archaeologists and threatened lawsuits flying around the field station the day after the chariot was lost. Another incident, in keeping with the mythos of cursed archaeological digs, occurred at 220-KV several days later when a worker fell into a 29-meter deep tomb and ended up hospitalized in critical condition. Thankfully, he stabilized after a few days and his prognosis is good. It’s unbelievable that he didn’t end up paralyzed. Part of the process of doing business in China, archaeological or otherwise, involves “guangxi” (pronounced “gwong-she”), a Chinese word that loosely translates to “networking”. It is important in Chinese culture to socialize with the people that you’re doing business or working with. Thus, Katrinka and I were feted with many a traditional Chinese banquet or dinner over the course of our stay in Anyang. These banquets generally take place in a restaurant or hotel, often in a private room. Everyone is seated at a big round table with a rotating server on top. The host, who always sits at the seat of honor opposite the entrance to the room, orders a number of dishes for everyone in attendance. Depending on how many people are seated at the table, various meat, fish, and vegetable dishes will be served. When they arrive, the dishes are placed on the table’s rotating server, which the host spins around so the guests can help themselves to the food. Everyone just digs into the same dishes with their chopsticks; at big banquets you have to be quick with the sticks or else a dish you like might spin right past you before you have a chance to grab something off the plate. One nevertheless must be careful in choosing the dishes from which one eats, as Katrinka learned one night at dinner when she ladled a spoonful of soup out of a bowl, brought the spoon to her lips, and halted just in the nick of time when she realized it contained a foot (of unknown origins, I might add). At another dinner, a dish was brought out and we were told it was gou rou (“go-roe”), but I mis-heard it as giu rou, which means ‘pork’ (and is pronounced, ironically, “jew-roe”). I dug in, thinking that it was a little tough, but not altogether bad. Katrinka, I noticed, was looking at me with an expression of disbelief and disgust. What’s the problem? This giu rou is pretty good! As Katrinka clarified for me that I was eating gou rou, not giu roe, I excused myself from the table and headed for the lavatory, wondering what breed of dog it was that I just ate. Drinking seems to be deeply ingrained in the Anyang culture; not surprising considering that the Shang dynasty’s Queen Fu Hao was entombed with enough wine and drinking vessels to last for several after-lifetimes. Rarely a night went by that we did not witness someone staggering drunk through the hotel lobby, helped along by friends. Invariably, someone would come up to me at my table in the lobby where I was working on my laptop and, with an ear to ear smile on their face, drunkenly try to talk to me in Chinese about where I’m from and what I’m doing in Anyang, while unknowingly flicking their cigarette ashes in my coffee. Another not-uncommon sight was a taxi parked in front of the hotel with a pair of legs flailing out the window while two or three doormen attempted to push them in. Muffled female cries of “Bu! Bu! Bu!” (“No! No! No!”) could be heard emanating from the cab. Nevertheless, Anyang’s citizens’ enthusiasm for baijiu, as well as pijiu (beer) and hongjiu (wine), has not mitigated their fundamental character. I simply can’t over emphasize how lovely everyone has been to us (even the inebriated folks). The Chinese are a supremely gentle people and their genuine friendliness is contagious. If people in almost any other country were as nice as the Chinese are, it would almost certainly arouse suspicion. But here, the friendliness is so obviously sincere and genuine that it’s almost impossible to ignore. It’s not just toward us, either; they are incredibly affectionate with one another. For me, the most fun aspect of interacting with the Chinese is enjoying and sharing their playfulness and sense of humor. Even across the language divide, it has been easy to share a laugh with most people. Those moments of mutual understanding have comprised my fondest memories of this trip. I know my spoken Chinese has improved because I can now elicit laughter because of what I said right, as opposed to what I said wrong! Still, one must be careful of what one says in China. One facet of Chinese culture is that if you tell someone that you like something that they have, they will sometimes give it to you. At breakfast one morning in the Ancai Hotel, Katrinka and I noticed that a waitress had a little pink plastic cat attached to the key chain on her belt. It was one of those little trinkets that come with some brands of baijiu. Katrinka told her how cute it was and the waitress gave it to her. The next morning at breakfast, Katrinka again thanked the waitress and told her how much she loves cats. The waitress told us that she had another cat that she wanted to give to us and she would bring it the following day. The next afternoon there was a knock on our hotel room door, and standing there with a broad grin on her face was the waitress with a cardboard box inside of which was a real live tiny white kitten named Mi Mi. I had to pretend to be allergic in order to worm out of this one. Unlike the citizens of China’s largest cities, the residents of Anyang have not had much, if any, contact with foreigners. One has to bear in mind that whereas an American could visit most of the world’s countries and easily blend in, a Westerner in China stands out like a neon sign. China is not a multi-cultural state – its 1.3 billion people are virtually all Chinese – so when a foreigner of any ethnicity other than Chinese shows up in a city like Anyang, it’s a major spectacle. Katrinka and I could hardly walk 10 feet down the street without attracting a crowd, or at the very least, eliciting calls of “hello!” People in Anyang are quite curious about foreigners and are particularly interested in Americans. Overwhelmingly, the two competing impressions that the Chinese seem to have about America are, 1) America is a very beautiful place, and 2) America is a very dangerous place. I can’t necessarily argue with either point. China is certainly every bit as enchantingly beautiful as America, but not nearly as dangerous in terms of street crime. It’s really incongruous to me that Katrinka could safely walk the streets of Anyang or Beijing alone at night, but would be taking a serious risk doing the same in Berkeley, one of the most educated cities in the wealthiest nation in the world. Sure enough, a couple of days later he showed up at the hotel with an ENTOURAGE, and Katrinka and I met with them in the lobby. It quickly became clear that the guy, Chen was his name, wasn’t actually a schoolteacher, but in fact worked for some local Anyang company that wanted to sponsor the English lessons for the Anyang kids. His boss had come along with him as part of his entourage and though she didn’t speak a word of English, she made it clear via Shen’s translation that she was extremely excited about our agreeing to teach the kids and hoped we could do it as soon as possible. Obviously, something was fishy about this thing, but Katrinka and I nevertheless conveyed that we would try to schedule something as soon as time permitted. We were very busy with Katrinka’s archaeology, however, and couldn’t commit to a specific date until we had a better picture of what Katrinka’s work would entail. We told them we’d be in touch within a few days. Well, the entourage showed up at the hotel every subsequent evening for a week, trying to pin us down to a date that we’d teach the class. Our schedule was still packed from morning to night with Katrinka’s work and that was our priority. We just couldn’t commit to a date yet. Shen’s boss became increasingly arrogant and demanding, claiming that they’d had signs made for the event and that the kids were anticipating it with much enthusiasm. They pointed out that the students would be leaving for summer vacation in a couple of days, so we just had to do it soon or else we’d send the kids home disappointed. Not wanting to offend them, we said we’d see what we could do. By this point we were so suspicious of these people’s motives that we were about to tell them to get lost. At the very moment Katrinka and I were about to walk away in frustration, one of the Archaeologists working in Anyang for the summer field season walked into the hotel lobby with his students from Canada’s University of British Columbia in tow. They had been out for dinner and had been drinking (guess what?) lots of baijiu and so Professor Jing Zhichun was in a pliant mood. We thought, great, here’s an opportunity to have Jing help us get out of our awkward situation, but before we could get a word in edgewise, the boss-lady was all over him, blathering away in Chinese. Jing smelled a rat, too, but figured it would be worth a roll of the dice for us to go to the middle school and teach the class. Jing would come along with us and bring a handful of his students as it would potentially be a good experience for them, too. If we got to the school and it turned out to be a total scam, we’d make a break for it. Katrinka and I were happy that at least we weren’t going to have to deal with this ordeal by ourselves! Just then, Shen handed me a book that was opened to a page filled with a list of various English words, such as ‘green’, ‘mountain’, and ‘lake’, with the different vowel sounds underlined for emphasis. On the opposite page was another list of different words with the varying consonants underlined. All I had to do, Shen whispered in my ear, was recite the words out loud so that the kids could hear them pronounced properly by a native English speaker, and pause after each word so the kids could recite them back. “Goat”, I said meekly, addressing the smiling schoolchildren. “GOAT!! !,” replied the kids in unison, almost knocking me over backwards. “BAAAAAARGE!,” came back the reply. I was getting the idea. “GIRRRRL!! !,” the kids responded. I was having fun now! Now that we were done with our English pronunciation lesson, Shen and company asked us to come along with them so that they could take some film footage of us by the red signs outside, then we’d come back in and teach another lesson. No way. We were getting out of there at all costs. As Professor Jing distracted the boss-lady by yelling at her in Chinese (as the camera continued to roll, by the way) the rest of us made a break for it. Shen and his cohorts literally chased us out the front gates of the school, through the village, and all the way out to the main road where we were able to flag down a couple of taxis and make our escape. Now Jing had his chance to explain what the scam was all about. Shen and his boss were operating a company that is putting out a book of English lessons that they’re trying to sell to the Anyang schools. They figured the book would have a great deal more credibility if it was endorsed by some authentic American English speakers. Our adventure at the middle school was their attempt at filming an info-mercial for the book! Jing phoned Shen the following day and threatened him and his company with a lawsuit if they went ahead and broadcast their info-mercial, which was clearly made in covert and dishonorable fashion. Tang Jigen, the director of the Anyang Archaeological Field Station, had a good friend at the local Anyang CCTV station, whom he called in an attempt to pre-empt the broadcast. A few days later, as Katrinka and I were working away at the field station, some workers came up to us laughing, explaining that they saw us on TV, along with Professor Jing, and that we looked pretty darn silly. Foolish, even. Turns out that the book people pulled an end-run and went to the Anyang County TV station after being told by the city station that they wouldn’t broadcast the info-mercial. In spite of it all, the experience was fun and a lesson learned for us all. Plus, we got to take an inside look at a rural Chinese middle school. But what, I was curious to know, did that smaller red sign underneath the big one at the middle school say? Alright…enough of my rambling. Hopefully you have a pretty good sense of what our experience in the heartland of China has been like at this point (those of you that actually read this far, anyway. Maybe I’ll send out a spot quiz…) I’ll leave you with one more little tidbit that should complete the picture of Anyang for you all.